Updates: New Channel + Possible blog sale & contest = New Beginnings! I'll admit I was a little apprehensive at first, being that I have worked so passionately towards what I have created on my current you tube page (http://www.youtube.com/LAURENN0XO), and I did not want to just delete all of the memories, and friends that I have made on that channel! But I have created a video telling people that I will be moving to Makeup By Lauren P, and I hope to see all of my friends follow me to this new channel before I delete LAURENN0XO for GOOD! Don't fret, if there are videos of mine from LAURENN0XO that you enjoyed, you will most likey find them at the new channel. I am uploading old videos as we speak, and I will organize them appropriatley in playlists so that you will know which ones are old videos, and which ones are newer. I also plan on selling some of my things (DVD sets, makeup bags, accessories, etc) and will post a video about that sometime soon. I also plan on throwing another contest, for my new channel! So I hope to see you on my new & improved page, MakeupByLaurenP! Featured Blog: "Married To A Mexican"
My biggest goal in life right now is to raise excellent children that understand the importance of hard work, education, service and love for God. Several years ago I set my own hopes and personal dreams aside to stay home and raise my children. I have to say it was one of the hardest things I ever did. Nevertheless, I have no doubt that it was the right thing to do. As I see my kids growing and turning out to be more then I ever expected, I need to remember that God has blessed me so much, and to him I will always indebted. Before I became a stay at home mommy, I was an advocate trainer for Sebastian Internationals cosmetic line Trucco. I loved the traveling and teaching the latest looks, but motherhood was calling and my kiddies needed their mommy at home. Now the kids are in school all day and I recently took a job as a personal chef which is my other love and the way you came to know me. One of her blogs titled "Latino Pride",spotlights Latino people who have given back to their community somehow, and display a talent in the arts. Past featured people include the organization R. Evolucion Latina, youth activist and college student Marisol Becerra, and Natalia Maribojoc, a amazing 13 year old singer. I am absolutely honored that Tina even reached out to me and considered adding me to the list of these amazing people. Please read about them on her blog! Tina reminds me of myself in a way. From what I have learned about her by being a long time subscriber and viewer of her, is that she is a woman with many interests and talents. She will not be placed in a "cookie cutter" of what she should be. She makes time for all her passions: Cooking, Makeup, Blogging, but most of all Family & God. I admire her for that! Thanks so much again Tina! Please vote for Lauren as one of the new faces of e.l.f. cosmetics! e.l.f. cosmetics is throwing a model search/contest to find their new models for the campaign, "beauty at all ages". They will be selecting four models from different age ranges and having a photo shoot with them in NYC. These four photos will then be posted on their website, where everyone will choose the grand prize winner! All of the prizes sound exciting, but what excites me more is the chance to represent a great company and the products that they create. Please help me by clicking this link, and voting for me! You can vote once daily, for only one model! So please let it be me! I would deeply appreciate it! I believe that I would be the perfect female model to represent e.l.f. in the year 2010 because I have a deep passion for beauty products and I understand how to sell them. 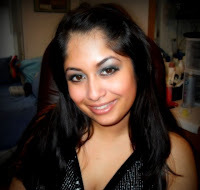 I am a beauty blogger, model, and graduate school student who is an avid customer of your company and appreciates the quality of e.l.f.’s products. I believe that I posses a “natural and ethnic” look that would enhance your company’s products. My mixed heritages of Italian, Puerto Rican, and Colombian will only help flourish e.l.f.’s vision of beauty for every type of woman. Combine that with my knowledge and passion that I have in your company, photography, and beauty products in general, I believe that I am a great asset as the next face of e.l.f. cosmetics. What I have been up to! Please watch the full video! I would appreciate it if you guys would follow me on my blog, since that will be taking the place of my you tube temporarily until I get my computer 100% up & running again! And while your on my blog, please take my poll that I have running now on which beauty products you prefer! I will mainly post on Blogspot and FaceBook, so feel free to follow me on those two places! Please vote for me as the next face of e.l.f. cosmetics! Which means I have lost nine...yes you heard right--NINE new videos that I had made for you guys...along with my work from my undergrad and grad school...and family pictures of my late grandmothers that I love. I have faith that some how my father (who works with computers for a living), will be able to help me! If for whatever reason, my computer is beyond repair, I have def. learned my lesson of backing up everything I do! Because I am now in my last year of grad school (already! ), and of the computer mishaps, I will not be posting on here as much as I like to. I normally do one post on here a week. Instead, I will be posting more on my blog, which is what I wanted to do in the first place. This video was put together very quickly just to show my subscribers who are not yet connected with me on twitter, facebook, or my blog: what I have been up to since my computer went kaput! I also wanted to take this time to thank all of my lovely subscribers, friends, and viewers on here: I do all of this for you guys! I truly love everything beauty related, and I love reporting back to you guys about great finds, hauls and looks of course! I will create a video on this soon, where I will show you how I press my pigments. The process might seem intimidating at first, but it is fairly easy (but can get messy!) once you get the hang of it. I must admit, I had one casualty while doing this--but one out of 12 is okay to me since it was my first time ever doing this! 1. An empty eye shadow palette. I used the one from Coastal Scents, listed above. 2. A pressing medium of some sort. You can use whatever you prefer, for this. I have seen people use Rubbing Alcohol, or just straight Water--with less than exceptional results. I decided to use this Mixing Medium from Coastal Scents because I have seen many good reviews on it. 3. A small mixing jar of some sort. I used a travel size container from CVS that you would normally store lotions in while you travel. 4. A small spatula to mix the pigments. Coastal Scents also sells these. I did not use theirs, instead I used a small plastic spoon that came with a package of ice cream that I bought! Hey you have to improvise sometimes right?! 4. A spray bottle full of Rubbing Alcohol. 6. Paper towels...it can get messy! These are the steps that Kathy CEO of Coastal Scents.com gives while she demonstrated how to mix pigments. "Take 1teaspoon of loose pigment powder/makeup, place it in a dish deep enough to mix in the medium. To your powder add by drops of your EZ Prez, begin with 20 drops. Using a mixing spatula (available at Coastal Scents), begin to mix and pull to the sides of the jar incorporating the liquid and powder together. What you are looking for as an outcome is a crumble of powder, when you pull it together to the side of the dish with your spatula it should hold together easily and then again when stirred loosen up. Be careful not to over wet your powders, you only need it to hold when pushed together slightly. Once you reach this stage, mist a makeup pan with 91% alcohol (this is available at your local drug store). Add enough powder to cover the bottom, place a quarter over a piece of thick plastic and press evenly and firmly. Remove the plastic and add another layer and repeat the above instructions. At this point you are ready to add the last layer to the palette (if using the Coastal Scents Palette and tins). Now, this is when you may want to use a hatch ribbon with a quarter on top of it to press, this will leave a professional looking finish on the top. Allow this to set overnight, if you are in a hurry you can place the pan in the oven at 200* for about 30 minutes, turn off and let cool. You now have a ready to use pressed mineral powder. Ingredients: * Dimethicone * Cyclomethicone * Polysorbate 20 * Isoproply Myristate * Alcohol"
Here, I am showing you 10 of the HIP pigments pressed. The last light eye shadow is my mother's bobbi brown eye shadow in Champagne that broke, so I fixed it for her by pressing it. In order to remove the tins from the palette, I just use a bent paper clip and grove it into the whole (which every tin has), and I do this until it pops out. This is fairly easy since both the tin and the backing of the palette is magnetic. After I popped it out, I am just showing that I peeld the name that is located under each Loreal HIP Pigment, and I stuck it underneath the tin so I will know the name of each eye shadow I am using. I hope you check out coastalscents.com, which has everything you need to press pigments! On September 10th, 2009, I was invited by my childhood friend Kathy, who works for Korres-- to their "Fashion Night Out Event". It was a blast! I invited a fellow you tuber Carol to come with me and we had complimentary facials done! I hope to soon interview Heather Mancini, Director of the Korres Retail Stores. So keep an eye out for that! "Head to Korres SoHo [110 Wooster Str] or Brooklyn [140 Montague Av] on September 10, from 6pm to 11pm for a ‘Detox Bubbles, Cupcakes & More’ evening. Both stores will feature a detox bar, serving complimentary antioxidant-infused cocktails based on the Greek skincare brand’s natural ingredients – Wild Rose, Pomegranate, Thyme Honey & Sugar Crystal, along with natural cupcakes. Detox on the outside too, with a Korres makeover or get advice on how to wear VOGUE’s hottest new season color looks using “green” make-up. All complimentary makeovers can be pre-booked; please RSVP to makeovers@korresusa.com with your ideal appointment time and you will receive our confirmation e-mail. To schedule by phone, call 212-219-0683 for an appointment our Soho location and 718-643-9425 for an appointment at our Brooklyn Store. All guests will be offered a gift bag including global best-sellers and Korres favorites of VOGUE’s beauty team!" Me getting ready for my facial, and Kathy working her skills on me! The eyeliners that Korres makes are amazing! I might just have to go back & pick some up! They glide on smoothly, have a great color payoff, and wont smudge--even in the water line! This is the first time I found an eye pencil that stays on in my water line. Thanks so much for inviting me to the Korres Fashion Night Out Event Kathy! The night of the event, I purchased a package of three Lip Butters in "Jasmine", "Quince", and "Pomegranate". This product is "a buttery lip balm that melts on the lips and offers a shiny, tinted finish. The combination of shea butter and rice wax offers deep hydration and softness, ideal for chapped lips". I enjoyed these products, the event, and customer service so much, I had to come back with my parents who also had facials done! May I just add that Korres, a company founded in Greece, also has a great line of products for men? Keep that in mind for your special man's birthday or the next holiday coming up! Korres has a gift package of great products for men such as after shave, etc., that would make a great Father's Day Gift! Three Lip Butters: "Jasmine", "Quince", & "Pomegranate"
My mother absolutely had a great time having her complimentary facial and makeup application. They are both very pigmented eye shadows! I hope you guys check out your local Korres store, and korresusa.com ! MakeupByLaurenP on You Tube: All Things Beauty! My Facebook Fan Group for the show "Blush"
C.V.S., Jaguar Luxury Cosmetics, Korres, Paint Cosmetics, Revlon, Shecky's Media Inc., & Skin Md Natural. Hey guys! Thanks so much for taking the time to stop by my page! My name is Lauren. I love makeup. I have been doing it for years. I am mostly self taught, but have had the privilege to meet professionals and have some in my family who have given me some great advice! I also have invested in some great makeup books, which I will probably make a video on also. I ran the Make up crew in my high school, I taught others how to apply stage makeup, which tied into my other passion--Acting & Theater. ♥ Shecky's Beauty Night Out! ♥ Shecky's Girls Night Out! ♥ Shecky's Holiday Night Out! 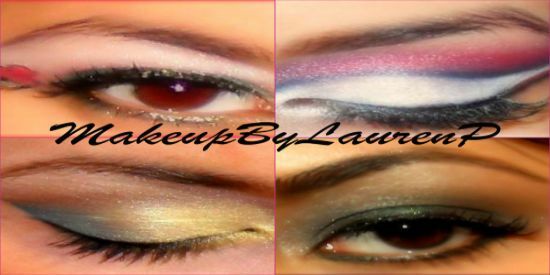 ♥ MakeupByLaurenP's Services in Action! ♥ Re-creation of a look from "New Moon"
♥ How-To Video: Pressing a Loreal H.I.P. Pigment! 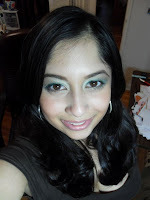 ♥ More reviews: Bare Escentuals, Leirac, & Coastal Scents! I would like to confirm that this is my personal blogspot and therefore, all the product reviews are based purely and wholly on my own opinion and experience from product usage. I do NOT get paid/work for, nor am I affiliated in any way with any of the brands mentioned in my blog. I do sometimes receive samples from companies to review on my blog however my opinions are always honest and not influenced by the fact that they are 'freebies'. In the interests of avoiding confusion, from now on (12/10/2009), I will state in my posts whether the products featured were bought with my own money or sent to me. All photos that appear on this site are copyrighted by their respective owners. I claim no credit for the media images unless otherwise noted. If you own the rights to any of the images and do not wish for them to appear on this site please contact me and the images will be promptly removed. I reserve the right to delete comments which I deem to be offensive or abusive.